Generation Sector award winners (left to right): Gregory Berg, Michael Crichton, Tom Alley (EPRI vice president of Generation), Thomas Hart and Michael Finneran. Several AEP employees were recently honored for their leadership roles in a number of Electric Power Research Institute (EPRI) research and development (R&D) efforts that explored and applied new and innovative technologies that benefit the company, the industry, and the public. 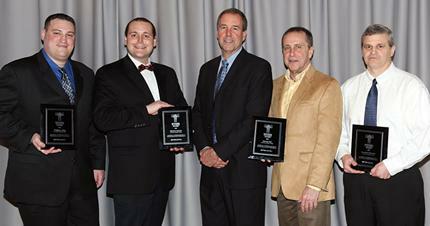 Collectively, the awards are known as the 2012 EPRI Technology Transfer Awards. Brian Schell, principal engineer – Grid Management Deployment, received an award in the Power Delivery & Utilization (PDU) category for his efforts in documenting a case study on AEP’s Smart Grid project as part of the EPRI Smart Grid Demonstrations Initiative: Four Year Update. Schell was part of a multi-company team that was recognized for deploying equipment, collecting data, conducting analyses and ultimately creating the case studies contained in the four-year update. Chris Schafer, functional system architect – Distribution Engineering & Operations System, was also recognized in the PDU category for leading one of the first major collaborations between the automotive and utility industries on modern plug-in vehicle technology through his demonstration of AEP’s Ford Escape Plug-In Hybrid Electric Vehicle program. Schafer also worked in a multi-company team that was honored for its overall efforts to incorporate original equipment manufacturer-engineered plug-in hybrid prototype vehicles into everyday fleet and company operations. Amrit Khalsa, staff engineer – Dolan Technology Center, also received an award in the PDU category for his involvement in a project to develop a modular communication interface specification that can be used for demand response. That work resulted in the Consumer Electronics Association releasing a new standard for a modular communication interface for demand response known as ANSI Standard CEA-2045. This standard defines a port/plug that enables off-the-shelf consumer products to be compatible with any utility demand response systems through customer-installable plug-in communication modules. Claudia Banner, principal engineer – Generation New Technology & Policy Support, was acknowledged for her efforts to support the advancement of renewable energy. AEP frequently receives inquiries from its customers and shareholders regarding the potential for solar power generation within its service territory. Banner compiled information to assess the viability of distributed solar photovoltaic generation using capital cost, O&M, land use and potential solar energy generation estimates from EPRI’s Solar Power Fact Book. Use of the Fact Book saved research time by compiling concise data for a range of technologies, locations, and incentives into one manual using clear and well-documented assumptions to prepare informed responses to customer inquires. Pedro Amaya, director – Civil Engineering & Geotechnical Services, and Tom Webb, director – Land, Environment & Remediation Services, were recognized for initiating a project to evaluate fly ash geotechnical properties and determine the propensity for fly ash to statically liquefy. The results suggested that fly ash is generally not prone to static liquefaction. These results can be used to support appropriate design and loading of ash ponds, particularly during pond closure. The results can also be used to support pond close-out schedules as the U.S. Environmental Protection Agency continues to consider its coal combustion residuals rule. Greg Carter, senior engineer – Plant Engineering Region 5; Gary Gibbs, manager – State Governmental & Environmental Affairs (SWEPCO); Tim Lohner, consulting environmental specialist – Environmental Services; and Al Wood, director – Water Quality Environmental Services, were acknowledged for their team efforts in applied environmental research. They worked with researchers from several other electric utilities to lead an analysis of water withdrawal and consumption for electric power generation, how it compares to water use in other industries and how conservation options can be used to reduce water consumption. The research team used EPRI information and tools to analyze the water use and consumption by sector for Texas, and then presented that information to the Texas House Water Resources Committee to inform the debate on how to achieve sustainable use of water resources in Texas. Greg Berg, protective coating specialist – Generation Structural Engineering; Michael Crichton, engineer – Generation Quality Assurance Services; Tom Hart, manager – Flue Gas Desulfurization & Chemical Engineering; and Michael Finneran, principal engineer – Generation FGD Systems & Chemical Engineering, were recognized for their work in applied generation technology. The foursome was part of a broad-based utility collaborative, sponsored by EPRI, that launched a rapid-response project to investigate the root cause of severe corrosion in flue gas desulfurization (FGD) systems installed in U.S. coal-fired plants and to develop new inspection and mitigation strategies. Utilities playing a leadership role in the collaborative included American Electric Power (AEP), We Energies, Duke Energy, and Salt River Project. Results of the project assisted the utilities in better understanding the factors contributing to the corrosion and in identifying tools for effectively dealing with it. The EPRI Technology Transfer Awards are given annually to EPRI members who have led efforts to apply R&D on behalf of their companies and the industry at large. The awards were presented in February in Austin, Texas, and Savannah, Ga., during meetings of EPRI’s various Technology Sector advisors. The Electric Power Research Institute, Inc. conducts research and development relating to the generation, delivery and use of electricity for the benefit of the public. An independent, nonprofit organization, EPRI brings together its scientists and engineers as well as experts from academia and industry to help address challenges in electricity, including reliability, efficiency, affordability, health, safety and the environment.